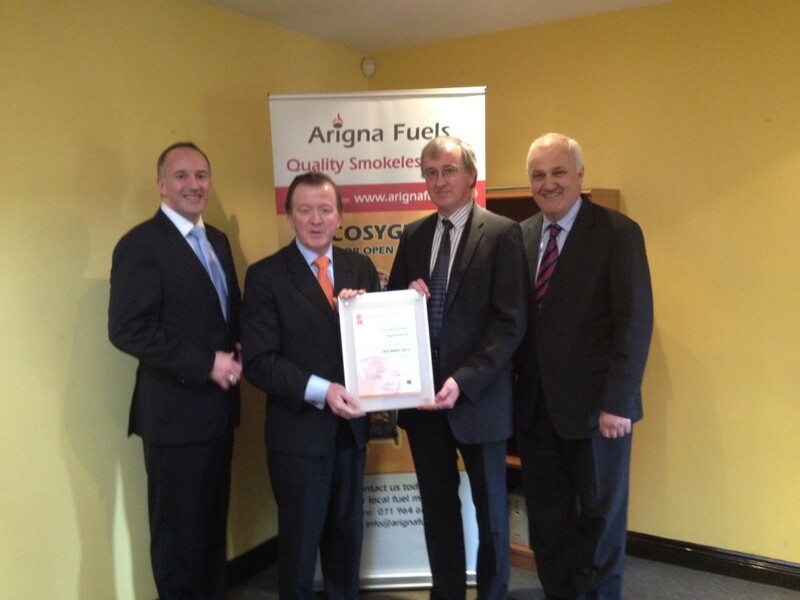 Arigna Fuels was very pleased to welcome Minister John Perry T.D. to their plant in Arigna to view the exciting new developments there. During a tour of the plant Minister Perry inspected the newly installed packaging and screening facility. This will allow the company to significantly increase its bagged output and also further improve the quality and presentation of its products. Minister Perry was particularly impressed with the commitment of the company to Research and Development. He was fully briefed on the major R&D project currently under way. This involves the production of ‘bio coal’ –a renewable fuel with the combustion characteristics of coal but made from renewable products such as woodchip, nut shells and even potentially rushes. This project is supported by Enterprise Ireland and will be progressing to pilot plant stage over the coming months after extensive lab trials. Arigna Fuels has always been at the forefront of new product development in the Irish and UK markets. Employing 50 full time staff and 15 more indirectly it’s range of smokeless and environmentally friendly fuels continue to grow sales as consumers demand better value for money in more challenging times. In particular our Ecobrite product for closed appliances has a loyal following from people who want real heat at an affordable price whilst Cosyglo continues to attract people who want a long lasting, efficient and environmentally friendly open fire. For more information visit: www.arignafuels.ie or contact Dave O’Hara Marketing Manager Arigna Fuels on 0719646002.